Choosing the best of all the Almaty hotels is quite a difficult task. Apart from having to choose the hotels by price, you also need to choose a hotel by its style, i.e. built before 1991 or after. Guess why? Many hotels in Almaty were built during the Soviet centralised rule, which had a great impact on the way buildings looked in all post soviet countries. Hotels were built for CPSU (Communist Party of the Soviet Union) members, for foreign tourists or everyday people. Majority of the hotels have adapted quite fast to the rapid changes after 1991. 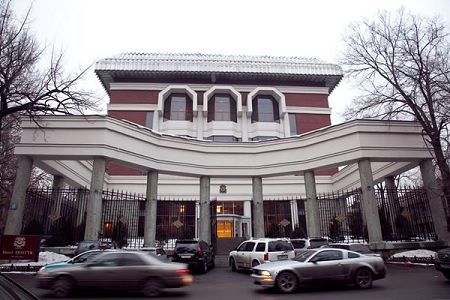 This five star Hotel Dostyk in Almaty is the first example to that. It is a listed building and has a very soviet look to it. Though it's interior has been fully renovated to the latest standards, and kept the old traditional look to it. 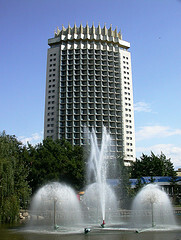 Hotel Kazakhstan, built in 1977, is another example. And of course there are many more of Soviet style hotels in Kazakhstan. The first western style luxury hotel in Almaty, Kazakhstan, I would even say in Central Asia was built in 1997. 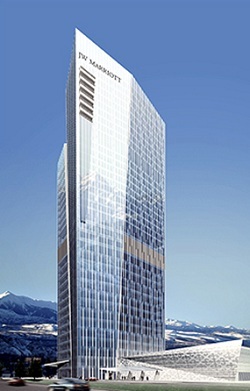 It was the Almaty Hyatt Regency Hotel, followed by the Ankara Intercontinental. One of the recent ones is Rixos. Don't quote me in this, but some people say that Almaty is in Top 50 of the most expensive places in the world leaving Toronto and Los Angeles behind. I personally think it might be true. Now I leave it to you to find out. Oh, by the way if you are a fan of Radisson or Marriott hotels, then plan your holidays not earlier than 2011 for Radisson. Wait for 4-5 years if you want to be one of the first customers to stay in this JW Marriott. See you then. There is a good choice of hotels in Almaty, it all comes to the purpose of your trip as well as your budget. Are you ready to pay for a presidential suite or a standard room, 5 star hotels or B&B type? Mostly the Almaty hotels are located in the city center. It takes about 20-35 minutes to get to the hotels from the Almaty airport, depending on the traffic. This map will help you find where the hotels are located. You need to view the map in a larger scale to be able to see the hotels by Star rate and then the alphabetical listing. 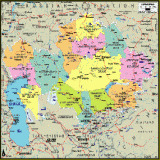 All types of hotels from 5 star luxury hotels to cheap hotels in Almaty can be found on this interactive Google map. Using this map is very easy. If you can't see all the hotels on the screen, you can use the arrows to go up and down, left and right. You can also use the hand cursor instead of the arrows. Simply click the cursor and drag the map the direction you want. Use + and - to zoom in and out. Click of the hotel icon to see the name and address or choose it from the alphabetical listing if you know the name of the hotel.